Exploring the thought of Mulla Sadra Shirazi, an Iranian Shi'ite of the seventeenth century: a universe of politics, morality, liberty, and order that is indispensable to our understanding of Islamic thought and spirituality. This lluminating study by Christian Jambet explores the essential elements of the philosophical system of Mulla Sadra Shirazi, an Iranian Shi'ite of the seventeenth century. The writings of Mulla Sadra Shirazi (d. 1640) bear witness to the divine revelation in every act of being, from the most humble to the most celebrated. More generally, Islamic philosophy employs an ontology of the real that is important to the destiny of metaphysics, an ontology that belongs to our own universe of thought. The Act of Being, nourished by the Sufism of Ibn al-'Arabi, the philosophy of classical Islam, the thought inherited from the Greeks, and the esoteric and mystical dimension of Shi'ism, seeks to make sense of this intuition of the real.Mulla Sadra saw the world as moving ceaselessly in an uninterrupted revolution of its substances, in which infinite existence breaks through the successive boundaries of the sensible and the intelligible, the mineral and the angelic. In a flourish of epiphanies, in the multiplied mirror of bodies and souls, Mulla Sadra perceived absolute divine liberty. Revealing freedom in the metamorphosis of the believer and the sage, existence teaches the imitation of the divine that can be seen "in its most beautiful form." 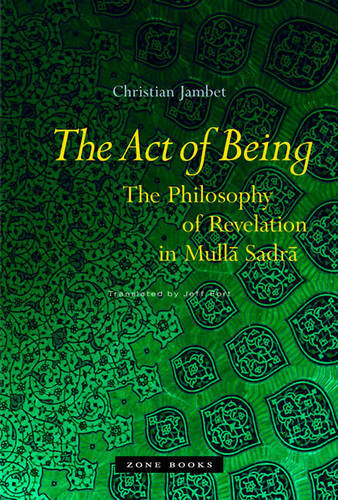 Reading Mulla Sadra reveals the nexus of politics, morality, liberty, and order in his universe of thought-a universe, as Christian Jambet shows, that is indispensable to our understanding of Islamic thought and spirituality.